I had a minestrone recipe for each season except for spring... I think with daylight saving and St-Patrick around the corner I was craving greens... So here we go with a super easy, clean and delicious spring minestrone! In a large dutch oven sauté the leeks, fennel and celery with the olive oil for a good 5-7 minutes, this will bring out all the flavor! 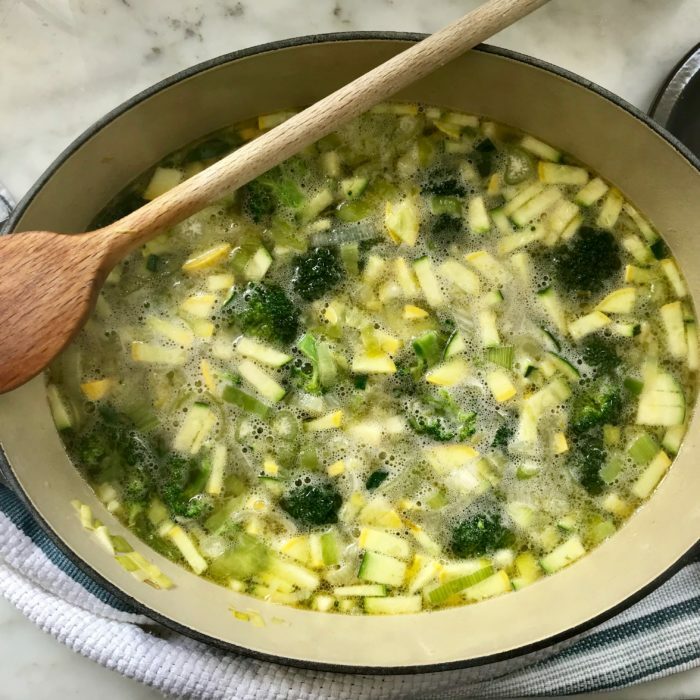 Add the zucchini and summer squash and keep on stirring for 1-2 minutes. Finally add the stock, beans, broccoli and parmesan grind. Bring it to a boil then lower to simmer for 10-15 minutes until veggies are cooked through but are still a bit crunchy. Add some salt and pepper according to taste and enjoy!! Soups always get extra flavor when they are made in advance, so I always try to aim to make mine during they day, let it rest and reheat it at night. But if you do not have time, it will still be super delicious!